Send this special Treat Yourself Tea Book to help your favorite Tea Connoisseur get some much needed relaxation. 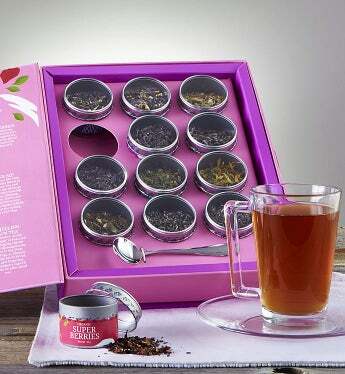 This unique book shaped box is filled with 12 tin canisters of delightfully unique loose leaf organic tea blends. They'll enjoy drinking the tea while they read all of the interesting facts about each tea printed on the inside of the book. Measures 9" x 11" x 2"